The forming of the first Jagdgeschwader proved to be so successful that a decision was made to form more such groupings. JG II was the coming together of Jasta 12, 13, 15, and 19. The combining of these units was to provide a mobile force that could maintain aerial supremacy over certain sectors at a moments notice. Its first leader was the well-liked Adolf Ritter von Tutschek. At the time of taking command he was a 23 victory with Jasta 12 and went to score a total of 27 before his death just over a month later. An excellent replacement was found in the energetic, if not fanatical, Rudolph Berthold. It was under his command that JG II really excelled. The book begins by tracing these events and also describes the forming of each component Jasta. First hand accounts vividly illustrate what is was like in those first few months and of the initial tasks undertaken in Operation Michael. Especially gripping are the accounts told by Hermann Becker and Joachim von Ziegesar. Here the reader is exposed to the drama associated with the attack on the Geschwader airfield and what it’s like to be a pilot cowering in a trench during the incessant bombing and shelling. The latter gives a fascinating insight into Jasta 15’s foray with their new SSW D.III aircraft and Veltjens’s subsequent “bagging” of a Bréguet in the type. It is not just from the German side that these accounts come from. Descriptions from the Allied side are also given and it makes fascinating reading to hear the combats from the “other side”. One example being Thomas Buffum’s description of himself being shot down in flames by Hans Pippart. As you would expect, the artwork is sensational, Harry Dempsey always seems to do his best work when replicating the schemes of the German machines. Forty aircraft are produced with an additional eight top views where further explanation is needed. There is a mixture of types drawn and they range from the expected Albatros D.V, Fokker DR.I and D.VII to the Pfalz D.III, D.IIIa, and Siemens Schuckert D.III, D.IV. Fans of the Osprey series will have seen some of these before but there is still a tasty sprinkling of new profiles. To the publisher’s credit, only a quarter have been repeated from previous volumes. 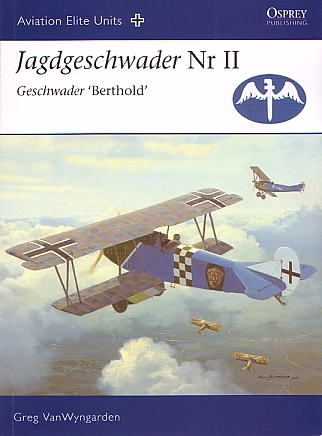 The book continues with the telling of problems with the SSW D.III and battle weary Fokker triplanes. This took its toll on the effectiveness of JG.II, and it wasn’t until an adequate supply of the Fokker D.VII came its way that the pilots were able to function properly as a unit again. Later chapters see JG II moving to Armee Abteilung C where they manage to score heavily against their inexperienced American opponents, September 1918 being a particularly successful month. At this late stage of the war, petrol was in short supply and the enemy was arriving in droves. Soon the armistice would come and JG II would be no more. More than 125 black and white photographs punctuate the book and are reproduced to an excellent standard. They are well chosen and the accompanied captions are most informative. Also included in the 128 pages are appendices that give details on JG II’s commanders, awards and aircraft used. Skilful use has been made by the author to tell the tale of JG II in an entertaining and easy to read style. The selected first hand accounts are excellent and create an eerie atmosphere around the event being told. This book was hard to put down and when I did, it was to head straight to the kit stash for the inevitable build.